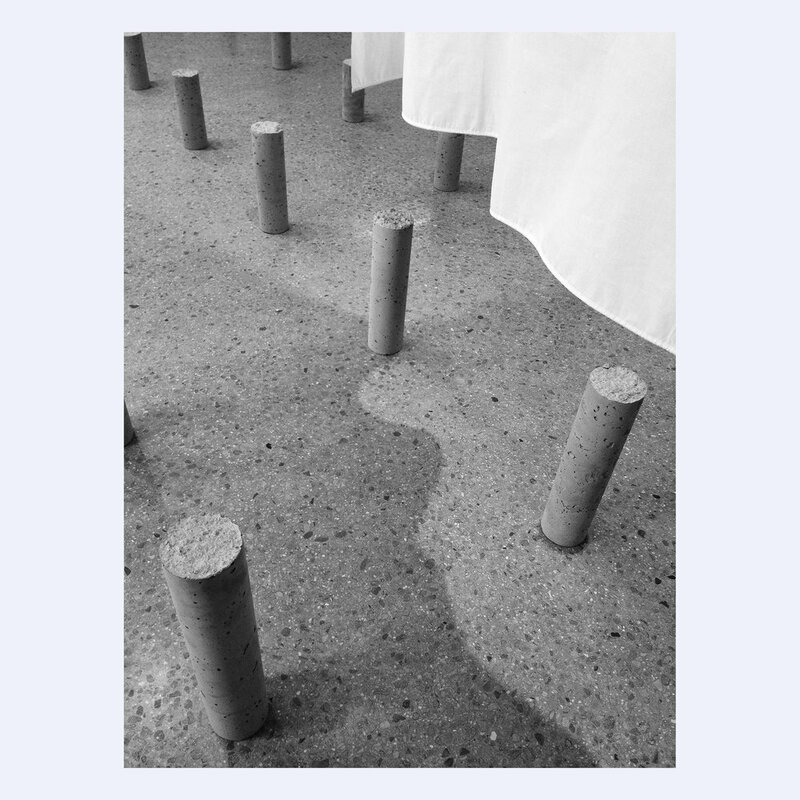 This work encourages bodily encounters (concrete phenomena). Walking past the fields of fabric and through the array of concrete constitutes the room. Instead of encountering the walls as holder for art, they are encountered forcefully. The array collides physically and phenomenally with the walls of the gallery and gradually emerges from the floor. Walking through the array makes these renewed encounters with wall and floor unavoidable. The proportions of the cylinders pierce the space above them. The taller cylinders are more precarious than the shorter, please be careful. In its transparency and dimension the fields are a foil to the cylinders of the array; they reveal (represent) the floor and walls in contradistinction. They at once create thresholds and frames. As a masking void they create absences in order to reveal presences. They are slices through space, rather than volumes. Rather than (only) being approached, this work – installation, rather than a sculpture or a painting – is ineluctable. In this way, the installation is a representation of the constitution of spatial phenomena. The array fundamentally re-orients our bodies in the room; our constitution of the space resolves through our bodily milieu, rather than just our visual field (holder for art, background for sculpture).